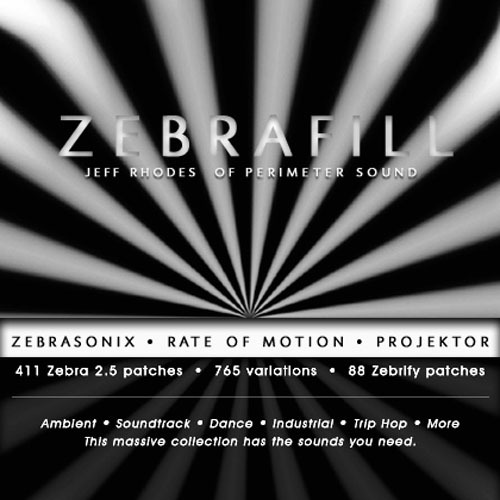 'Zebra Fill' is a bundle that includes all 3 Zebra 2.5 preset collections from Jeff Rhodes of Perimeter Sound. You'll get 411 Zebra 2.5 patches and 765 variations of those patches and 88 Zebrify patches. Whether you produce pure ambient soundtrack type music, floor hopping dance tracks, or pounding industrial metal dirges, there are sounds for you in this massive multi-collection combo. Rather than remain static, or worse yet - to just copy the sounds you've already heard before, I've tried to create some patches that I would want to use in my own tracks. And ultimately that's what I did. If you've heard any of my 'Ambient Glitch' series of loop samples, or any from the 'Dance Glitch' series, then you have heard a number of these Zebra patches in action. Each set has a slightly different focus, and each set definitely has some new and different programming techniques used. So no matter which set you open, you are bound to hear something you will want to record. THIS IS A BUNDLE CONTAINING 3 SOUND SETS - IF YOU ALREADY PURCHASED "ZEBRASONIX", "RATE OF MOTION" AND "PROJEKTOR" SEPARATELY - HAVE THIS IN MIND.